I still find it interesting to note that whenever fares go up, it’s because of “the cost of operating the ferries”. I assume that means the cost of fuel, as well. But I noticed when gas prices took a nose dive, ferry rates continued to go up instead of down, certainly not reflecting what should have been lowered operating costs. Whatever. As long as it costs almost $40 to go round trip in a car on the ferry, I’ll continue to drive around. As for going over without a car, I understand the New York ferries that run between Staten Island and Manhattan are free (they don’t take cars, though), and the ferries depart every half hour around the clock. Makes you wonder what we’re doing wrong here in Washington state. Fuel is roughly 1/3 of their operating costs. And there are capital improvements they need to pay for too. So fuel is a factor, but not the majority of their costs. And if you drive onto the ferry every day, or frequently enough to buy a multi-ride card, it’s $23 round trip. If you need to pay to park in Seattle, it’s more expensive to drive around then it is to ride the ferry. And even though the Staten Island ferries are free, they still cost money to operate. So what Washington State is doing wrong is not finding a stable and dedicated revenue source (other than fares) to pay for the ferry system. Yes, they haven’t found anything in 16 years to replace the MVET (license tab fees) they used to get. They got money from the transportation revenue package last year for 8 years, but then they’ll be looking for something else. That’s just to cover the money they’ve been having to pull from other transportation pots. Riders are still be expected to pay more than 70 percent and that’s not going to change. It’s just where they can get the other 30 percent. Lower fuel costs definitely help. They’ve been adding bigger, new boats and they need bigger crews, which costs. Lower fuel prices are huge for the ferries. 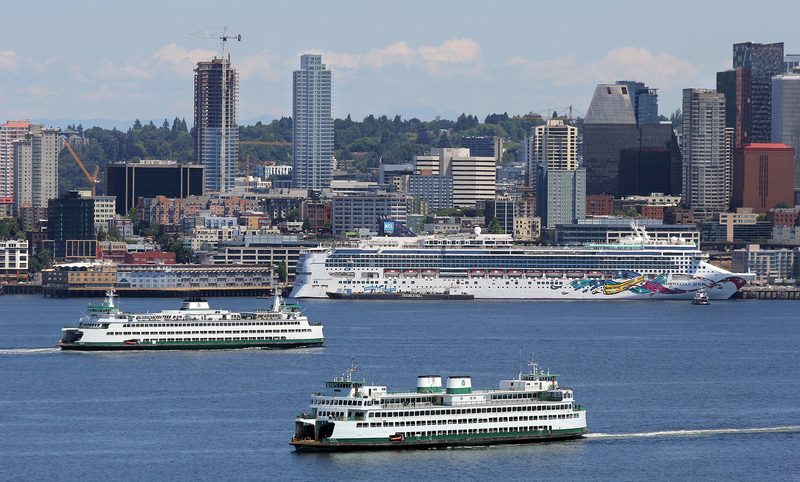 There are higher labor costs, however, with the new, bigger ferries. They take more crew. I don’t think we can ever expect fares to go down. Driving around is awful. You have to pick your poison, I guess. Sorry. No good answer. It will be interesting to see if ridership declines as long term ferry commuters retire. The departure of the masses is in progress as indicated by transit companies of late having trouble replacing employees. Will there be a shift from everyone going to the tech world returning to jobs such as buss drivers and ferry employees. More apprenticeship style jobs than instant tech jobs. It is a world where the majority want to start at the top instead of working their way up through apprenticeships. Time will tell. Evan, I go over to Seattle maybe once or twice a year. I am currently living on less than $200/month of state disability so to me, the round trip by car on the ferry is a HUGE waste of money. So far driving around has only taken me a little longer than taking the ferry. And if you have to pay to park, it costs just as much if you take your car over, more even than if you drive around with gas as cheap as it is these days. I do my best to ensure that I drive during non-commute hours, and yes, I have been caught in one or two backups. But at the same time, I have also been a foot passenger on the ferry when I worked in Seattle and have experienced the ferry breakdowns and delays then, too. Then there’s also the frustration of planning to take your car on the ferry and finding out the ferry is full. At that point, why wait an extra hour for the next ferry when you can drive around in practically the same amount of time? These are the things that make rely, and continue to rely, on my car as transportation, instead of the ferries. Ridership will also increase when Seattle finished the seawall, and thus the access to the ferry. Perhaps then the ferry system will provide some signage for people wanting taxis, bus route locations, straight forward access to the stadiums. Convenience for walk on passengers is important.